A wine museum will open doors in Melnik this Saturday, December 21st, 2013. 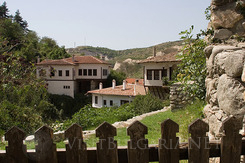 The new attraction in the smallest town of Bulgaria will help the development of wine tourism. The wine museum is located in the wine cellar of one of the hotels in the town. A rich exposition of wines will be arranged in several halls. Visitors will be able to trace back the history of wine and wine production during the centuries. The museum will also offer a wine tasting hall, where visitors will be able to taste and find the wine that most suits their personality. The collection at the moment offers 400 bottles, including some very expensive exponents. Local enologists will provide additional information and will tell the story of the vine growing and the wine production in the region.